marital bless: Well, that's different. I think I've mentioned it before, but the night we went out to do the pizza pictures, we met our first neighbor. Tony and I cautiously introduced ourselves, as we literally found out that day that our mortgage had been denied and we weren't sure any longer if the house was in our future. Mike had his two children on the sidewalk with him and within a minute, Isaac and Ben were fast friends. Ben is 5 years old and obliged Isaac when he asked to see his toy. You, as well as I know, that as far as preschool boys go, from there on out they were practically best friends. Progressing from playing with the toy, they were then playing tag in the front yard, declaring who was fastest through excited screams. I listened with my heart guarded, as Tony and Mike talked, establishing a common desire for pond hockey on our backyard pond, as my eyes drank in the sight of Isaac and Ben chasing after each other. Ezra and Josie kind of pretended they didn't know what was going on and will not think twice about when they first met. I was having a pretty hard conversation with God, trying to refrain from berating Him for this memory. Asking if He was only trying to make the uncertainty of the house harder to handle. I didn't know Mike, and I didn't know his son, but I saw the opportunity for my boy to have a close friend. 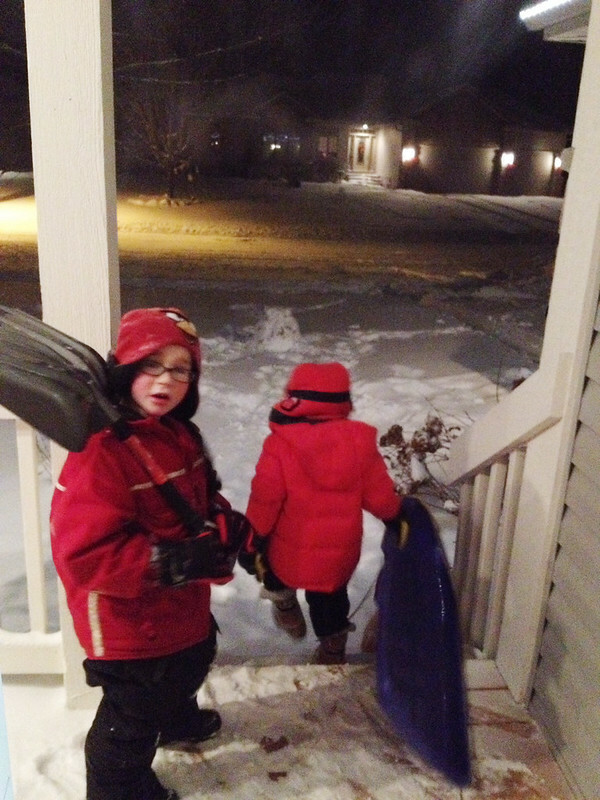 Last night we had quite the snowfall and after dinner, as I was surveying the mess of our house [most of which is still in boxes], the doorbell rang. I knew there was pretty much only one option, so without much more of a pause to confirm I told Isaac that it was Mike and Ben. Mike asked if Isaac could come down to play with Ben in the snow as he blew out their drive and that they'd come back to do ours. You guys, I think the State Fair has only made Isaac happier. Specifically asking for him to play. I have so many hopes for this house of ours and all of the changes we've gone through to get here and in just one evening I can see that the ball is rolling. oh leah! it might be my pregnancy hormones, but i started tearing up at this story! :) to imagine how great isaac felt and, having grown up with neighborhood kids/friends, the memories that will be made and all that he'll learn! how great! it's meant to be!! So sweet. I can only pray for this kind of neighborhood and friendships for my boys someday! You are incredibly blessed! There is nothing like great neighborhood friends. Oh goodness - how special for him to have a friend that can just come on over. I teared up a little reading this!! That's amazing and I'm so happy for you. Oh that's wonderful! I'm curious as I think you might live close to my brother and his family. My brother is a hockey player, so it just seems like they'd meet on the ice sometime. Of all your posts I think this one touched me the most. I miss those door bell ringing days. When my daughter was little we lived in a neighborhood and she would play with her neighborhood friends for hours. Now we live in the country and people think we are blessed with our home and land, but I am so empty inside because my boys will never know what it's like to have their friends come to their door and ask them to play outside. You and your family are blessed and I am so happy for you. Friends are what life is all about.